Vusi Mbonani, chief financial officer of Sizwe Medical Fund. 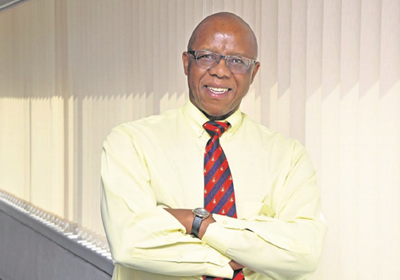 Vusi Mbonani is a numbers man – crunching them and balancing them – and, with a career spanning nearly 30 years, he’s seen a lot of change. When he joined Sizwe Medical Fund as its chief financial officer in 2014, it seemed like a natural move, given that he had begun his career with the scheme through its then administrator, Sizwe Medical Services (now Sechaba Medical Solutions), first as an assistant accountant in 1990, and as its chief financial officer and a director by the time he left. As Sizwe Medical Fund turns 40 this year, Mbonani reflected on not only the scheme’s growth and changes, but his own too. “Sizwe came into being before the Medical Scheme’s Act (131 of 1998) was promulgated and, at that time, it was easy for the founders to differentiate themselves from other schemes. As an example, when they started they also offered funeral insurance that was attractive to black clients who they were targeting at the time, and they accepted second wives to be part of one’s beneficiaries,” he said, laughingly. But central to the scheme’s founders’ guiding rationale in starting the business was bridging the gap in quality of healthcare for black people who, in the late 1970s, had no access to quality private care. “At that time there were no medical aids that accepted blacks and/or private hospitals that serviced blacks so they were looking at more than catering to patients, but also creating environments for specialists who were black to work in because private hospitals then wouldn’t allow them to practice,” Mbonani recounted. The founders – which included political and business stalwarts Dr Nthato Motlana and Dr Phakisi Mokhesi – first formed the Lesedi Private Hospital in Soweto, but found there were people who didn’t have enough funds to access it and so formed the medical scheme to assist. Fast forward to today, and the scheme now boasts over 47 000 principal members, mostly blue-collar factory workers. It has also transformed from what was a predominantly black medical scheme to a more inclusive one with new challenges to keep itself competitive and its product offerings relevant. One of the scheme’s biggest current cost drivers is in-hospital stay claims. Of the R2 billion paid out by the scheme for claims annually, 40% is for hospital claims and 14% is for medical specialists. Mbonani said the scheme was awake to the fact that the current global explosion of non-communicable diseases such as diabetes, hypertension and cancer was also increasing the burden in the healthcare sector and, because of this, awareness about the diseases was key. “We arrange wellness days with different partner companies and have stakeholders who come in and conduct tests for high blood pressure, on eyes and so on. We’ve found that we can save the scheme a lot of money if we catch illnesses early,” he explained. As with other schemes, they have seen cases in which members try to defraud the scheme. According to recent statistics from the Board of Healthcare Funders of Southern Africa, 10% to 15% of all medical claims are fraudulent, abusive or wasteful. This reportedly adds R22 billion in expenses to the R150 billion healthcare industry. “There are various types of fraud, some of it has to do with ‘over-servicing’ by specialists, when a service provider sees you today and tells you to return in three days with no real need to. “In some instances, members claim from pharmacists for, like, R2 000, purporting to be buying medicines, yet you get the record of the transaction and it says ABC pots, or you go to an optometrist and we get a claim for Gucci spectacles. Despite all the challenges in the industry, Mbonani said he still enjoyed the problem solving and strategic decision making his job entailed, as it all constantly kept him on his toes. “I do enjoy it, I enjoy working with numbers … and as you go upwards in your career, your scope broadens and you become exposed to other sections of the business, such as marketing, and to other disciplines as well, such as clinical specialists. “In our case, we typically involve internal clinical executives in most of our decision making, and they give us an idea of what things really cost medically and what things are needed so that, when we make decisions on claims, they are informed,” Mbonani added. He continued, “I think, like any financial person, when it comes to expenditure, you try to balance because everyone tries to have the lions’ share of the budget. Once that’s agreed, all that’s left is to monitor that people stick to their budgets. But those discussions for budget allocations are … interesting,” he chuckled. And with the impending implementation of the National Health Insurance (NHI) – government’s plan to provide universal health coverage for all – the challenge for schemes will be finding where they fit in the market. “It’s not yet clear what the NHI will cover, and the challenge for schemes is that the NHI will be compulsory so, depending on your target market, your typical blue-collar worker will find it difficult belonging to two schemes. So we’ll see what it will cover and where we can still fit in our offering, but as it stands the fear is that it may cut into our member base. I think the number of schemes around will definitely shrink,” he stated. Aside from the ever-pressurised role of overseeing the fund’s financial management, Mbonani said he enjoyed spending time with his family, making time to go on holidays and prioritising his home life. He is also an avid Orlando Pirates supporter and, now and then, you’ll find him swinging a few clubs on the golf course.